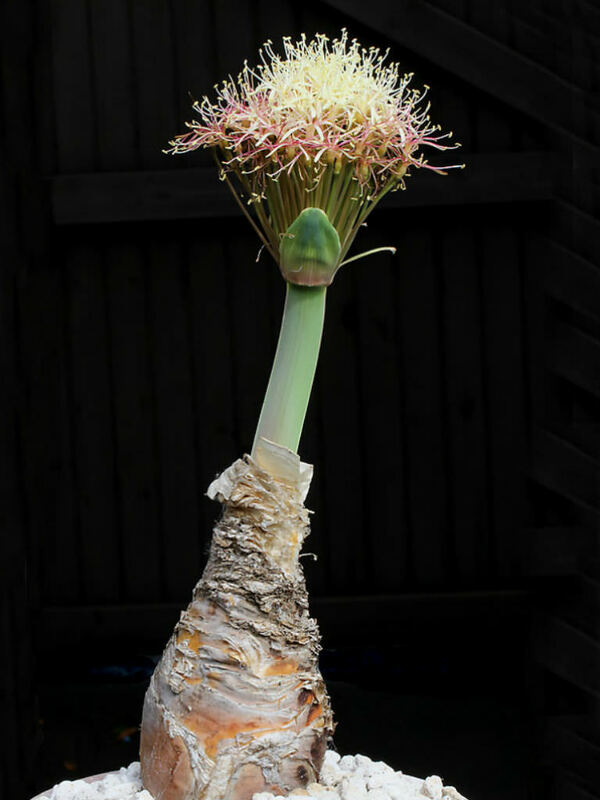 Boophone haemanthoides is a deciduous, winter-growing and summer-flowering geophyte up to 20 inches (50 cm) tall. 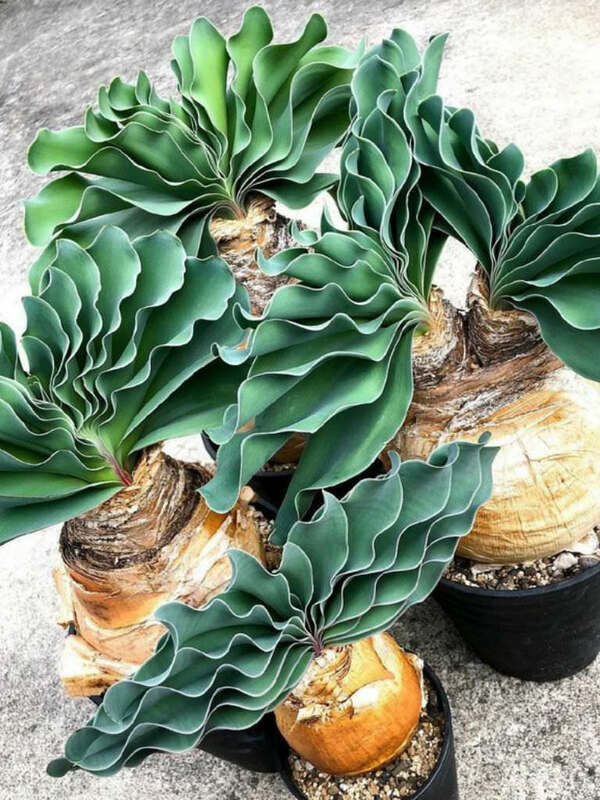 It is grows from a massive, egg-shaped bulb. A great deal of the bulb can be seen above ground. 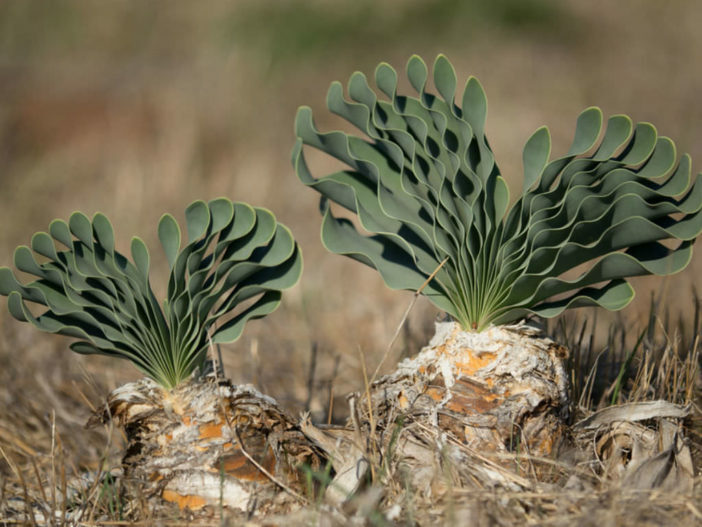 It produces a spreading fan of up to 20, strap-shaped, intensely glaucous leaves, produced in 2 opposite rows. The leaf surfaces are flat or slightly to deeply channelled and the leaf margins vary considerably from straight to slightly or strongly wavy. The dense, brush-like flower head emerges from the center of the bulb from early to mid summer, after the leaves have died back. The umbel is enclosed by 2 oval-shaped bracts, and is carried on a thick, maroon, pinkish brown or yellow stem. The sweet-scented flowers are initially white, cream or light yellow, ageing to dull pink. USDA hardiness zones 10b to 11b: from 35 °F (+1.7 °C) to 45 °F (+7.2 °C). 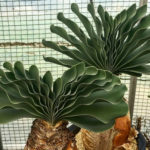 Namaqua Century Plant is a striking plant for a large pot, and also makes a handsome feature planted in bold groups in rock garden pockets. 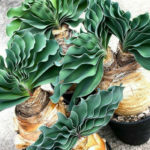 It is important to note that the bulbs are highly sensitive to excess moisture during the winter growing period, and require a completely dry summer period when they are dormant. This plants do not survive for long outdoors when planted in high rainfall areas. They require high light intensity to grow well, preferring full sun for as much of the day as possible. 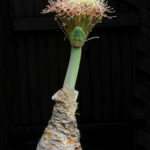 A pot at least 16 inches (40 cm) deep is needed for a mature bulb. When displayed as a pot subject, it performs well when placed on a sunny patio. 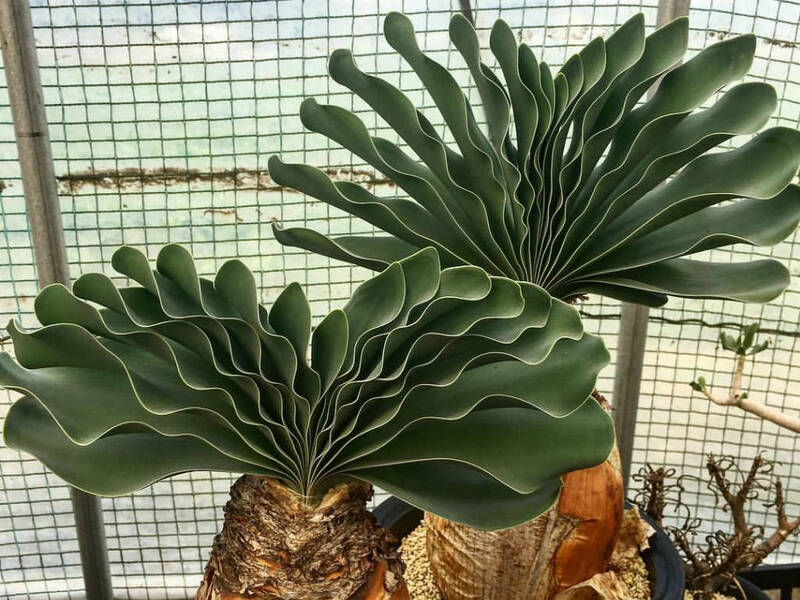 Boophone haemanthoides is native to Namibia and the Cape Provinces of South Africa.